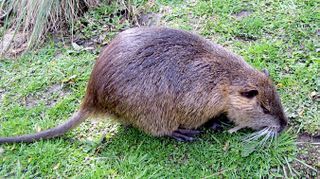 Reports last week stated that Rebecca White, of Abbeville, Louisiana, had sued Wal-Mart for injuries she allegedly suffered when a "large wild nutria" ran out from behind a rack of Coca-Cola products, causing her to run over her own foot with a shopping cart. Nutria (myocastor coypus), for those who may not know, are large semi-aquatic rodents (myocastor means "mouse beaver"), indigenous to South America, that were brought to Louisiana in the 1930s for their fur and then escaped or were released into the wild. (Although my knowledge of semi-aquatic rodents is of course encyclopedic, I learned these particular facts from the Louisiana Department of Wildlife's very informative site, www.nutria.com.) They breed prolifically, love the wetlands, and in fact are eating the wetlands — according to the LDW, there have been as many as 20 million nutria splashing around the state, devouring wetland plants, rice, and sugarcane, posing a serious ecological threat. Ms. White claims that at least one of these was lurking in the Abbeville Wal-Mart, just waiting for the chance to scare her into running over her own foot. Which she did, allegedly breaking several bones and causing nerve damage. She alleges that employees then added insult to injury by making light of the incident, telling her that "she had an encounter with Norman," the name they had bestowed upon the nutria that they obviously knew had infiltrated the store. The lawsuit contends that Wal-Mart was negligent in failing to warn her about Norman, by not making adequate efforts to capture and remove Norman, and by not taking steps to protect her from Norman (and from her own shopping cart). As of May 7, Wal-Mart had not yet been served, and so would not comment on the suit. Based on prior similar cases on which I've reported, involving alleged attacks on women by geese, squirrels, bats, and birds, Ms. White's chances of success are extremely low. Her likely loss would make the score Animals 5, Women 0. Louisiana has a major nutria control program underway, and you can do your part by eating as many as possible. The program's webpage at least implies that this is in fact part of the plan, by providing recipes for several dishes featuring the allegedly tasty flesh of the nutria. Recipes are offered for nutria chili, nutria jambalaya, smoked nutria and sausage gumbo, stuffed nutria hindquarters, and something called "Enola's Smothered Nutria," which requires one three-pound mouse beaver smothered in Enola's Secret Seasoning. The recipe reminds you that when stirring the nutria stew, "scrape the bottom of [the] pot to remove all the goodness." Mmm-mm.